A cummerbund (Persian: کمربند‎, translit. kamarband) is a broad waist sash, usually pleated, which is often worn with single-breasted dinner jackets (or tuxedos). The cummerbund originated in ancient Persia, and was adopted by British military officers in colonial India, where they saw it worn by Indian men. It was adopted as an alternative to a waistcoat, and later spread to civilian use. The modern use of the cummerbund to Europeans is as a component of a traditional black tie event. The word cummerbund is the Anglicized form of kamarband (Hindustani: कमरबंद; کمربند), the name commonly used in the South and West Asia including India for the article of clothing. It entered English vocabulary in 1616 from India. It is a combination of the Hindustani words (kamar) meaning 'waist' and (band) meaning 'strap' or 'lacing'. The 'waist-band' was a sash accessory worn by Indian men for many occasions. (Before the British colonial presence, Persian was one of the court languages in India, hence the Persian influence). The word cummerband (see below), and less commonly the German spelling Kummerbund (a Germanized spelling variation of the English word), are often used synonymously with cummerbund in English. Today, the word kamarband in Persian refers to anything which is or works like a belt, be it a clothing belt, a safety belt or a ring road around a city center (کمربندی‎). The form of the cummerbund is a wide band around the waist, and its origin as part of black tie determined the acceptable colours. Once it was adopted as civilian dress, beginning as a largely summer option with informal dinner jackets, such as Burmese fawn and white, it was restricted to the narrow range of colours which accompany black tie. These were predominantly black, sometimes midnight blue to match the trousers, and occasionally maroon (the normal hue for coloured accessories). The pleats face up because they were originally used to hold ticket stubs and similar items,[page needed] explaining the slang name 'crumb-catcher'. However, the cummerbunds worn as part of the US Army Blue Mess and Blue Evening Mess uniforms are worn with the pleats down, as prescribed by Army Regulation 670–1 Chapter 24 Section 10(b). The US Navy Uniform Regulations NAVPERS 15665 stipulate the cummerbund be worn with the pleats up for the Navy Dinner Dress Jacket. The contemporary use of the cummerbund is purely aesthetic, providing a transition between the shirt and the waistband. The fastening is a ribbon around the back, tied or held shut by a buckle or velcro. In contemporary use, it is now common to see coloured bow ties and cummerbands, often matching, but this is considered non-traditional. They have also expanded in less formal situations into use with components of white tie, particularly by musicians, who sometimes wear a white cummerbund instead of the traditional piqué waistcoat. The cummerbund of the French Foreign Legion is blue. The units of the French Army of Africa (such as the Zouaves or the Chasseurs d'Afrique) wore cummerbunds of 2 different colours: blue for European soldiers and red for Native recruits. 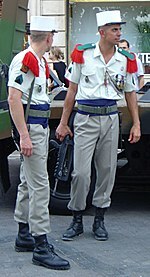 Some current French regiments, related to the French colonial history, still retain cummerbunds as part of their full dress uniform (notably the French Foreign Legion and the Spahis). Similar to the cummerbund, a cummerband is an accessory to the dress uniform used extensively in modern South Asian armies including Indian Army and Bangladesh Army and others. It is generally worn during ceremonial parades and dinners. The colour or combination of colours varies widely according to regiment or corps. Unlike the civilian cummerbund, a leather belt is worn above this cloth piece and one end hangs free displaying an ornamental fringe. During the 19th and early 20th centuries, cotton cummerbunds were commonly worn by athletes participating in gymnastic and/or combat sport training and competition. A cummerbund is also an informal word used in scuba diving to mean a wide waistband either on a buoyancy control device designed to provide more comfort to the user than a standard waistband and usually made of a stout fabric backed with velcro fastenings, or on a two-piece dry suit where a flexible rubber waistband helps to maintain a watertight seal between the jacket and the pants of the suit. ^ Villarosa; Angeli (1990), The Elegant Man: How to Construct the Ideal Wardrobe, p. 148 . ^ "Google Translate". translate.google.com. Archived from the original on 15 September 2017. ^ a b Bridges, John (2008). How to be a Gentleman: A Timely Guide to Timeless Manners Nashville, TN: Thomas Nelson. ^ Flusser, Alan (2002), Dressing the Man, p. 246 . ^ Walroth, Chris (March 2001), "Behind", The Wholenote Magazine, archived from the original on 15 February 2009 . Wikimedia Commons has media related to Cummerbunds.